I wanted to support internationalisation on a pretty complex Flex project that was sharing some Components and Skins using Flex Libraries (swc files). I have spent a good amount of time searching for documentation and its just not there, the only examples I could find are the very simplest options you could possibly use and they are not even clear, so I'm going to try to write all the steps to get internationalisation working on your Flex app and compiling with Flexmojos here. This technique might also work with other versions, but I haven't tried. As you can see, I am planning to support English, Spanish and Japanese. 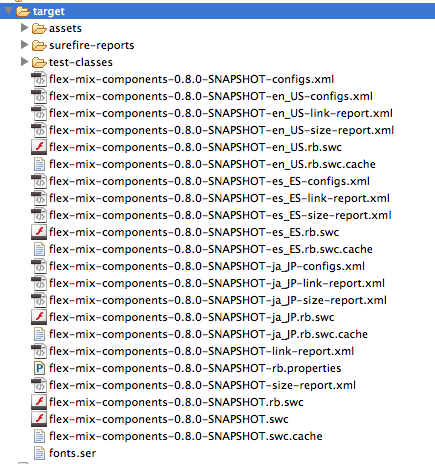 Flex framework doesn't have all the libraries translated to all the languages, so when you compile you may find that some resource bundles from the framework are missing (in Spanish, for version 4.6.b.23201 the missing resource bundle libraries are flash-integration-4.6.b.23201-es_ES.rb.swc and playerglobal-4.6.b.23201-es_ES.rb.swc). If you want to do a quick test on 4.6.b.23201 try adding Japanese only, all libraries are available for it. 2- You need to change the name of the folder "es_US" to your preferred language, in this case "es_ES"
If you run mvm clean install again it should pick up the new library and continue with the compilation further, probably until the next resource bundle is missing and you will have to repeat the translation process again for the new file until you have all the required bundles translated. I'm falling in love with this Adobe AIR tool to read APIs. It takes a few minutes to get it fully functional with all the APIs you want, but after that it can be extremely useful. We have to modify eclipse.ini to add the same values as in Windows. 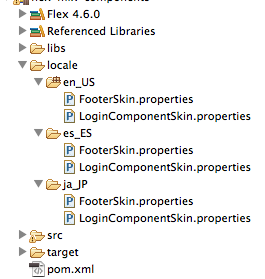 To find this file we have to go to the app file (Eclipse.app), right click on it and select "Show package content". We will get a new finder window with a folder named "Contents", we have to navigate to "Contents/MacOS" and we will find "eclipse.ini" in there, you have to edit this file and add the parameters in there. Adobe has just launched a new Flash application that allows you to test your webpage in multiple browser emulations, I´m sure designers will be very happy about this. YESSSSSS!!!! 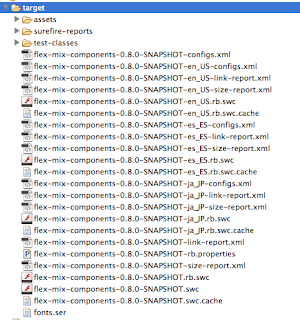 I just read this blog entry on Mike Morearty´s blog about closing the "Add watch expression in Flex Builder. We have reciently introduced mock4as in our project, I found it very easy to use and very helpfull when mocking for tests. 2 - We call the trigger function, this will cause the app to call the mockDelegate "getSomething()" function, which will register the call into the "mock" variable. I have recently joined a team of great developers in a medium-sized project. When I accepted the role I was told that I was sometimes going to work remotely from home and I had never really done that before. What I didn´t spect at first is that I was actually going to kick-off on the project remotely, and I was a little nervious about it.. how was I going to know how they work? How long would it take me to catch up with the guys that had been working there for months? What would I do if I got stucked? Well, I have now finished my first week on the project, and yes, from Spain and updating my changes to Denmark. The experience has been really good, although it is true that there are some things you need to do face to face, I think the solution comes through finding a balance on the time remoting and time in the office (maybe 80% - 20%???). AGILE DEVELOPMENT - STAND UP MEETINGS: What we currently do is just to dial into a meeting room on the main offices building, people onsite just get into the room and people remoting just join the conference call. I have to say that starting on the project remotely straight away made it a bit hard to follow this meetings at first as I don´t know who is talking and I can´t "put faces" to the voices, but I guess this will get better tomorrow when I phisically meet my workmates :) I think that in the future when we all have better Internet connections at home this will be done in a conference call with webcams (maybe it could be done today without problems), and this will help newys catching up quicker. Don´t missunderstand, I think face to face is necessary, in fact I consider miself a very social animal, but using the appropiate tools this time can be brought down without being harmfull to the project. What is your experience working remotely? I wish you all a merry Christmas and a happy 2009!